The Kärcher SC3 is a brilliant addition to any home. It is a 100% chemical-free tool which cleans your home amazingly using nothing but water. 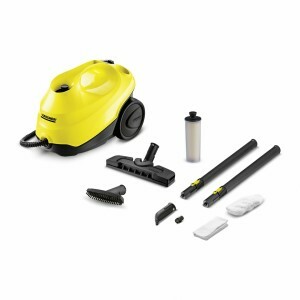 The Kärcher SC3 makes cleaning your home very easy and rooms can be cleaned in a matter of minutes. It also has an array of connectors that ensure you can deep clean your whole house. I used the Kärcher SC3 to clean my house and used it in many different rooms such as the bathroom, hallway, living room and kitchen and I was extremely impressed by, not just how easy it was to use but also how clean it made everything. Using the different accessories I could clean so many different areas. I used the streamer to clean my bathroom tiles and they sparkled afterwards. I also used the steamer in the kitchen to clean my hob and oven hood and was amazed how clean they were using just water and no chemical cleaners. I usually use bathroom and kitchen cleaners but did not need to when using the Kärcher SC3. My favourite feature of the Kärcher SC3 is that it can be used to clean the BBQ grill. As anyone who uses BBQs knows, cleaning it is a nightmare. You need to try and fit it into your sink to wash it and you are scrubbing constantly. I used the Kärcher SC3 steamer on my BBQ and it made cleaning it so easy. I attached the round bristle brush to the steamer and used this to clean the BBQ grill. The combination of the steam and the bristles made cleaning the grill so easy and it did not take long at all. I thought this was absolutely brilliant! Another great feature is that the steamer has a child-lock on it so it is safe to use with little ones around. When you are not using the steamer you can simply put the child-lock on and then no steam will come out of the nozzle. The Kärcher SC3 is a fantastic addition to any home. It is so easy to use and the results are brilliant. I would highly recommend purchasing one for your home. The RRP for the Kärcher SC3 is £179.99 and it is available from www.kaercher.com.